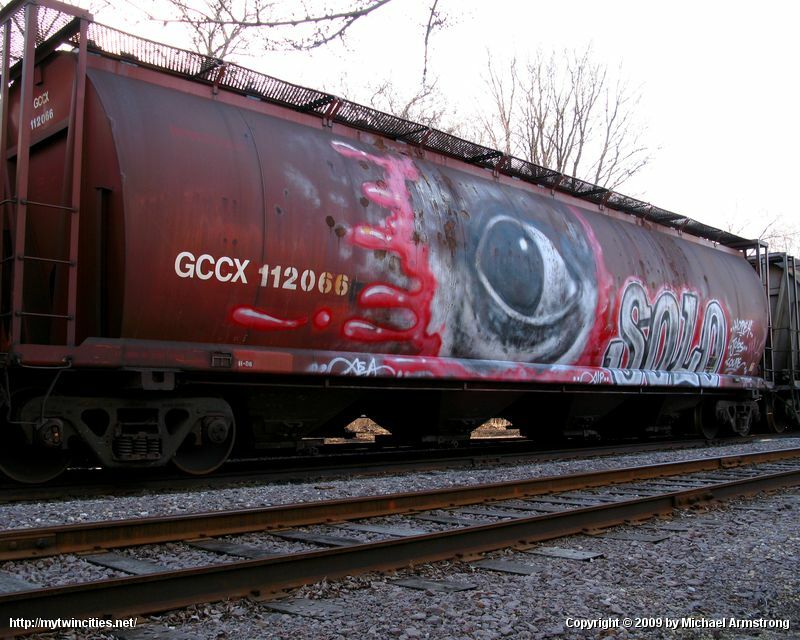 Here's the rail car that a good friend turned me onto the other day. This looks to be a local spur, probably for Minnesota Commercial, with a two-track siding on which a number of hopper cars had been parked. Of the eye sightings, it would be interesting to know in what order they were done. Is the ink (blood?) dripping border a progression from the normal red border I've seen in the past? Also, I note that "Solo" is more elaborate than previous appearances, but it's in the same colors, so I'm still confused whether it's a moniker/alias or a status. Last fall I learned two tiny bits of additional info about the artist, but nothing to help me find or meet him. The first piece is that it is a guy doing these. The other tidbits, I'll save for later.